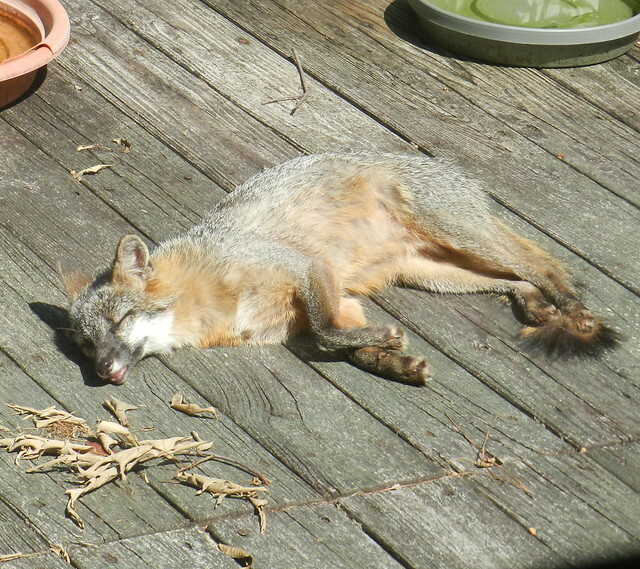 For the second summer in a row, a fox family has showed up on my deck. They are fun to watch from my door and windows. I'm guessing the bird are less amused when the foxes drink out of their bath. Trying to nap is hard when you itch. 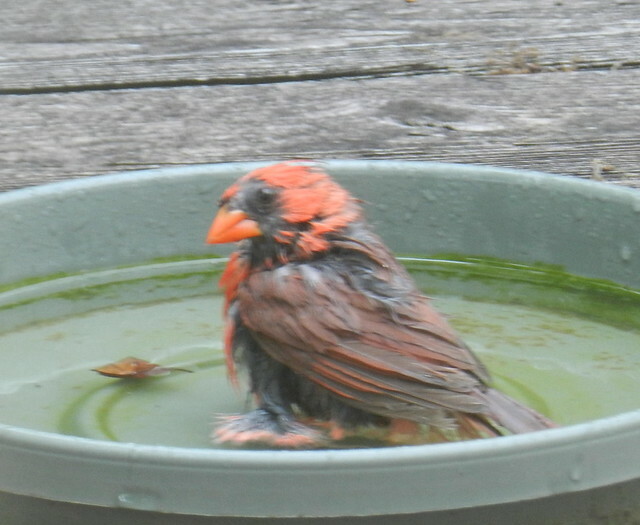 The male cardinal below is enjoying a bath. 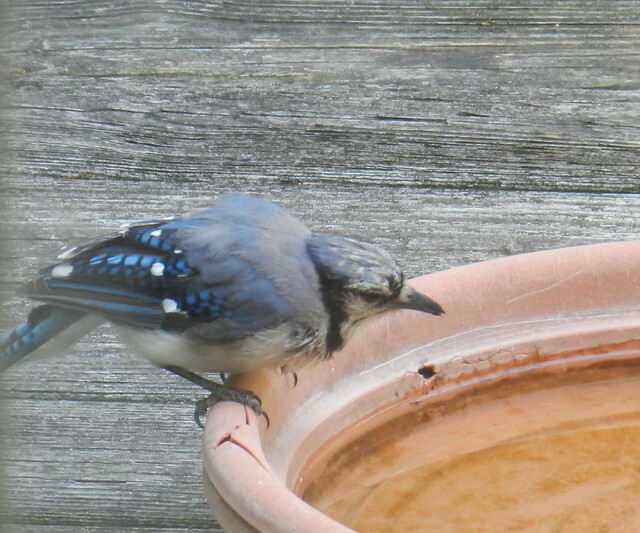 I've seen quite a few bluejays lately. 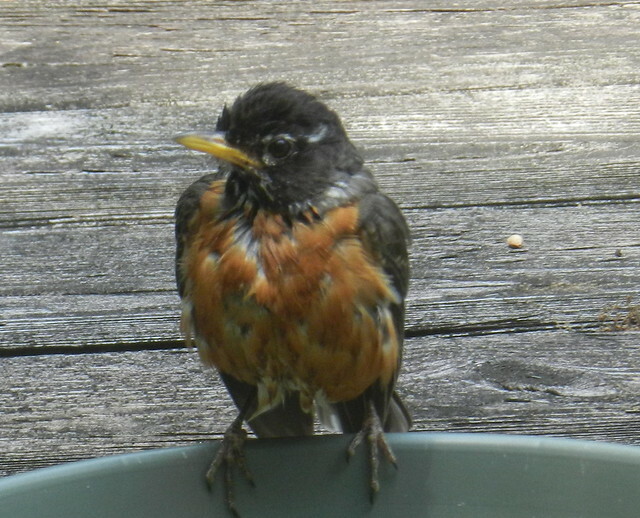 American robins always spend a lot of time bathing on my deck in the summer. 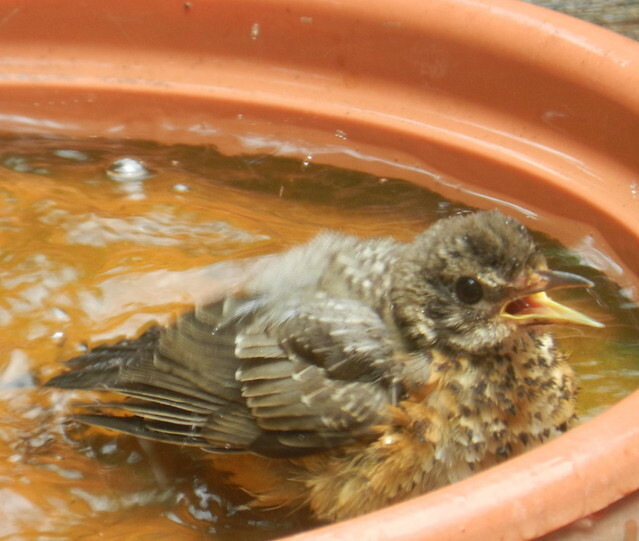 Juvenile American Robins are always fun to watch. 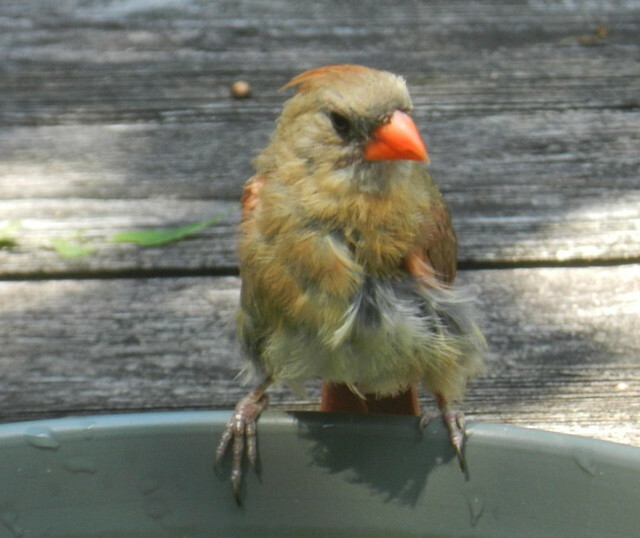 Below a female cardinal's feathers look so soft. 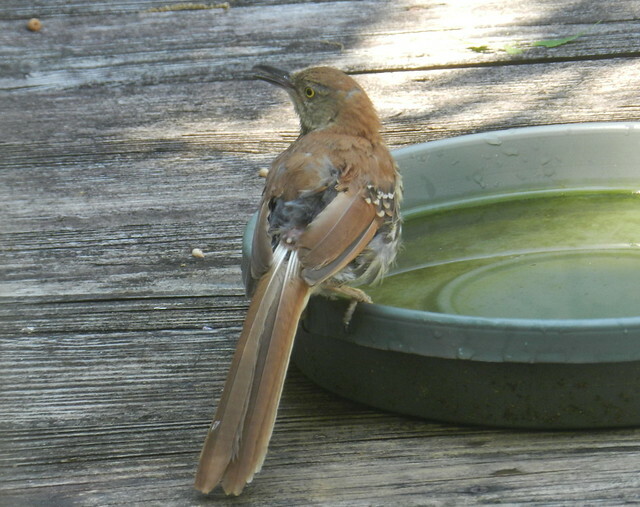 Next a brown thrasher is deciding on a bath. Wow, the fox family looks like they have made themselves right at home. Very cool! I see one occasionally but never that close. Hope you are having a great summer! Oh, I love the fox family, Carver!! How wonderful to have them make their home there!! How fun to watch them!! And, of course, your birds are SO beautiful!! Thanks for sharing the fun and the beauty!! Have a great week! 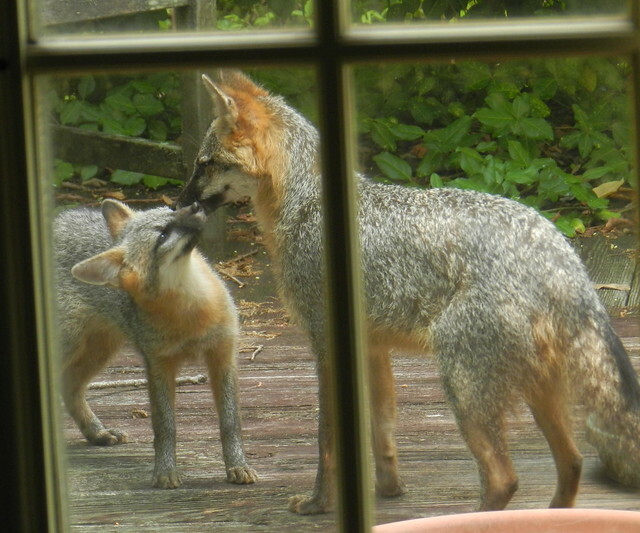 Oh wow, the fox and its young is a cool sighting.. What a neat visitor to your deck. Love all the birds too, great shots. Enjoy your week! Nature on your doorstep. Word is obviously getting round the neighbourhood about your wonderful hospitality. What a gorgeous series of photos! The fox family is so amazing! And all those lovely birds! A wonderful post! Lovely shots Carver - especially the visiting foxes. You got such lovely visitors and great photo opportunity! Great series of pictures...all the best! 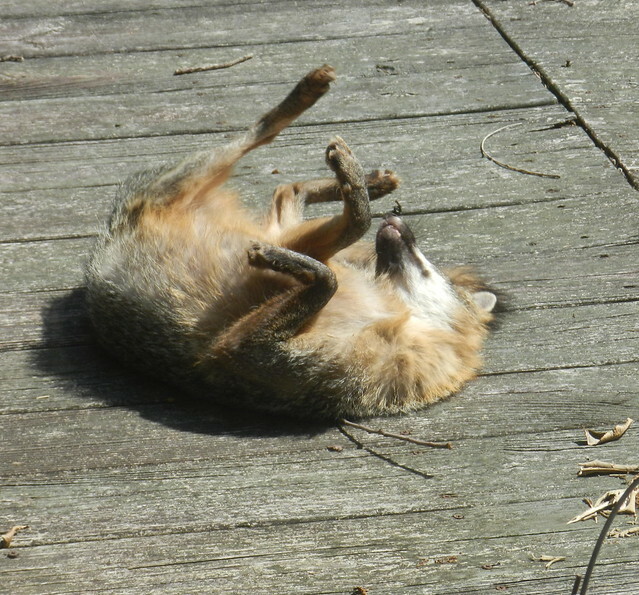 Amazing that you have foxes on your deck. Oh gosh - what a treat to see foxes that close up! Lovely. Those pictures are simply superb. So nice and amazing to watch foxes so close up! They really seem to be very comfortable rolling around on your deck¨And i just love the pictures of the little birds. Your deck and garden are simply wonderful places!! You have the most wonderful deck, a critter magnet! Wow Carver. 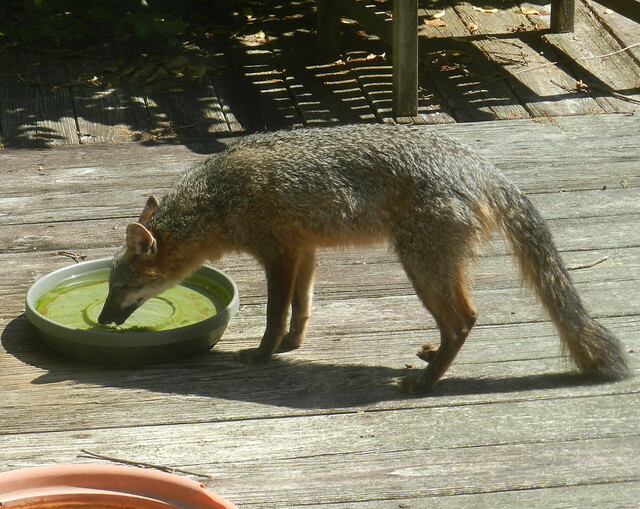 How cool to have the foxes visit. Very cool photos of the foxes carver and delightful ones of the birds. The foxes are so beautiful! Precious! If I had that display on my deck, I'd never get anything done. Wait ... I don't have that display on my deck and I still don't get anything done! Wonderful shots you got of the birds and foxes. I'm jealous. Foxes are so shy, good shot. So nice for them. To have that fox family on your deck ... just absolutely stunning and amazing. So glad I took the time to catch up on your posts (we have wifi where we're camped this week, yay!). THANK goodness for Feedly, so I didn't lose out by missing something as wonderful as this post.